Argentina is known for its natural beauty and diversity in a landscape that adds to its charm. Many interesting tourist attractions here. People from around the world come to spend a relaxing holiday. In Argentina you can find a subtropical forest in the north, to the farthest south of the Antarctic ice, the geography of Argentina offers a variety of exciting trips, from some of the world's highest mountains and impressive waterfalls, ancient forests, the beauty and variety of promises something special for everyone. Argentina is an amazing natural beauty, the city is a very unique culture. Argentina has deep cultural ties to Europe, which is especially visible in Buenos Aires with broad streets, excellent museums, great theater, world-class restaurants, pulsating nightlife, plus much more. One of the major tourist attractions of the world, Iguazu Falls on the border between Brazil and Argentina. This waterfall can be compared to Niagara Falls on the border between the United States State of New York with the Canadian province of Ontario. Iguazu Falls is actually even larger and more unique than Niagara Falls. Niagara Falls reached a maximum altitude of 51 meters, while the Iguazu Falls reaches a maximum height of 82 meters, with the furthest distance is 2.7 miles wide. The uniqueness of Iguazu Falls that are not owned by other large waterfall which is similar to her two-tiered, with a large size and nearly the same height. So, there Iguazu river water that falls in the form of a giant waterfall into the river at the bottom with a height of about 60 meters to 80 meters. Then rushing to then fall back into the river below it again with almost the same width and height. Forming a very beautiful scenery. Especially when viewed from afar, either through the river below, or through the air. 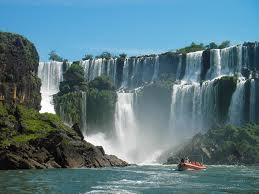 This is one of the most spectacular of Argentina tourist attractions to be seen. A glacier wall, with lots of ice tower, 4km long and 60m high, full of life and sound. When the ice falls, it makes a very big sound into the lake, where icebergs are floating dark blue. If one looks at the glacier for one day from the other side of the beach, people aware of different faces through the reflection from the sun. 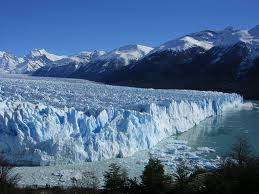 Perito Moreno gletser is a part of Los Glaciares national park also has a number of areas imressionable ice, like glaciers Upsala (595 sqkm with one of the largest in the world). Here it is possible to practice many sports, ice climbing, trekking, horseback riding, and boat ride. Buenos Aires is the capital and largest city of Argentina, and the second-largest metropolitan area in South America, after Sao Paulo. It is located on the western shore of the estuary of the Río de la Plata, on the southeastern coast of the South American continent. Experience porteño passions: tango, soccer, food, fashion and fantastically frenzied nightlife is describe Buenos Aires. There are popular tourist attractions that you can visit in Buenos Aires : Teatro Colon, is As one of the world's major opera houses, has hosted the likes of Maria Callas, Toscanini, Stravinsky, and Caruso. Plaza de Mayo, Plaza de Mayo is the center of the city (town, in fact, is really built around it), some of the most important events in Argentine history occurred here. 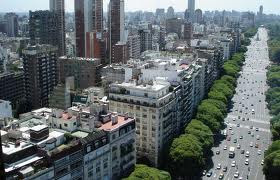 Para Recoleta, this region is the most fashionable place in Buenos Aires to eat,adjacent to Cementario de la Recoleta, final resting place of Eva Peron. San Telmo, hailed as the most beautiful part of Buenos Aires. Stone streets and colonial buildings set the atmosphere for a variety of shops and boutiques, tango parlors and cafes. Palermo, is an area of ​​forests and lakes, composed of many small one. Among the interesting thing is a pleasant rose garden filled with sculptures, polo fields, and the Japanese Garden. 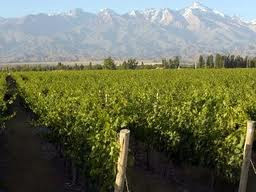 Mendoza wine region is considered as the heart of the wine industry in Argentina. Located in the foothills of the eastern Andes vineyards are planted in some of the world's highest altitude. Mendoza City is the place to base yourself if you plan to tour the vineyards. Various tour operators also make the city a great place to organize rafting, skiing and other adventures in the Andes nearby.